When you work all day and then have to take care of the house, family, and other things, it can be hard to make sure that your dog isn’t neglected. It’s great to play in the yard, but some dogs need more. The weekends can be a time when long walks, hikes, and other activities can take place but weekends are also the time when laundry, groceries, and socializing happen. Most of us work Mon through Fri, which means our dogs are alone for at least 40 hours a week. This amount of alone time can sometimes be a contributing factor to behavior issues. If your dog likes playing with other dogs, the best solution is to enroll your dog into dog daycare. Your dog will get to interact with dogs of all ages, sizes, and energy levels. It will improve her socialization and can be vital in terms of curbing behavioral problems. Younger dogs can learn how to play properly, learn body language of other dogs, and learn pack integration making them better canine citizens. Also, for the time your dog is at the daycare, she will be asked to sit, stay, and have other commands reinforced. She will be called by her name to “come” and learn what is appropriate and inappropriate behavior. If you have been working on teaching your dog to not jump up on people and let the daycare know, they will tell your dog to not jump with the command you use. Many daycares are very open to trying to help reinforce and positively reward behavior with praise, touch, and fun. It also means year round play time in a large play area. Some dog daycares have indoor play areas and others have outdoor fenced areas. Before signing your dog up, you can usually tour the facility and ask about the safety measures the daycare employs. Dog daycare is obviously more expensive than leaving your dog on its own but it is worth every penny. A tired dog is a happy dog. A tired dog is also a well-behaved dog. A tired dog also means that when you come home tired, you’ll be winding down together and have a great evening. Halloween Costumes for Your Pet! Great article with great points. Big dogs especially need more interaction and exercise throughout the day. 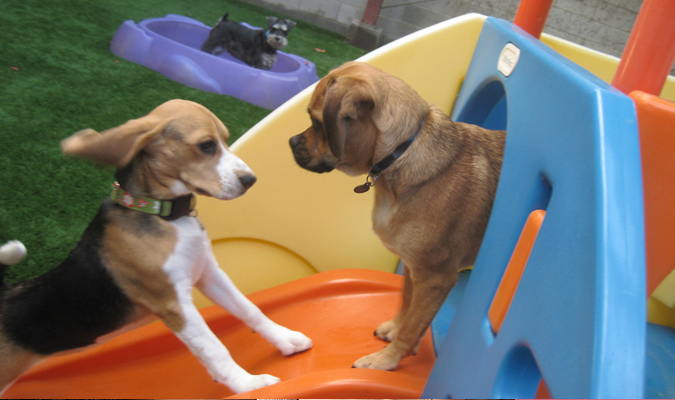 In fact, our pet resort facility in SC has recently added a group play for doggie daycare, so that dogs can play with other dogs. Anyway, this is a great article, thanks!